I am pleased to announce that, at the recent Annual Meeting of the Pennsylvania Defense Institute, I was appointed as Vice President of the North Region of the PDI. I thank the PDI President, Patrick Sweeney, Esquire of the Philadelphia law firm of Sweeney & Sheehan for this appointment. I will also continue to serve as the Co-Chairperson of the Auto Law Committee of the PDI. 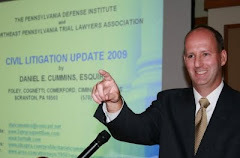 Anyone wishing to become a PDI member (and/or wishing to join the Auto Law Committee in the PDI), can contact the Executive Director, David Cole, at coled01@padefense.org or go to this LINK to the PDI website to join.